Jared Unzipped: What A Game! 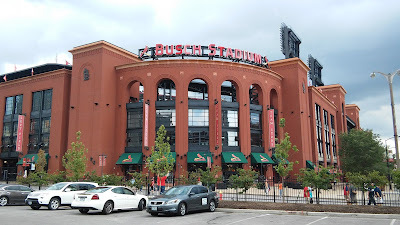 I had an amazing time today at Busch Stadium. The entire stadium, along with the Cardinals Hall of Fame, is something I never thought I'd see in person. On multiple occasions, Crystal reminded me to close my mouth because my jaw was hanging open in amazement. There's so much history steeped in the Cardinals organization. Even though I'm just a lifelong fan, I feel really thankful to be a even a small part of it. The Cardinals trailed for most of the game today against the Chicago Cubs, but they had an explosive eighth inning and took the lead. The crowd was absolutely ecstatic beyond belief. They won the game with a score of 4 to 3. Crystal and I toured the stadium after the game once everyone cleared out. We walked to the top deck and captured some amazing photos. All in all, today was one of those "bucket list" events that I'll never forget. After the game, we crossed the Mississippi River and snapped a few more photos -- this time of the Gateway Arch and the entire St. Louis skyline. St. Louis is an intricate and expansive city, but full of life and vibrancy. I hope I can come back here sometime soon.